This is one of my 2008 projects .It was a kit by This & That. Pattern called Minnesota Morning. I think this is the same company that put out Peggy's Button Bag pattern that she posted in the end of November. 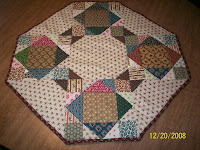 That was also made with charm squares. I love the civil war prints in these!